Wacky Waters from Playtech is a fun, light-hearted game that takes players to the bottom of the ocean in search of fortunes. The game is a standard video slot board (five reels, three rows) and there are fifteen fixed win lines. The game’s symbols have all been amusingly illustrated with cartoon representations of various aquatic animals making up most them. In terms of bonuses and features, there are a good number of side games and special rounds that keep the action varied and enjoyable. This is particularly useful for higher volume players who might get bored quickly on less diverse offerings. Nice look and feel. Wacky Waters is a light-hearted title and all its design features reflect this. Great bonus rounds. We love games with plenty of special features. Wacky Waters does not disappoint in this department. The fixed win line arrangement might not be to every players’ tastes. It limits the number of possible ways to spread out what is bet per spin. Puffer fish = 3,000x the line bet. Shark = 750x the line bet. Octopus = 300x the line bet. Starfish = 200x the line bet. Fish = 150x the line bet. Seahorse and prawn = 100x the line bet. According the game’s information screen, Albert the Blowfish swims about minding his own business until he lands on the centre of reel three. Once this occurs, he puffs up until he’s ready to pop. As he deflates, he will leave between one and six blowfish symbols scattered randomly across the reels. This can result in some massive prizes if they land in the right spots. 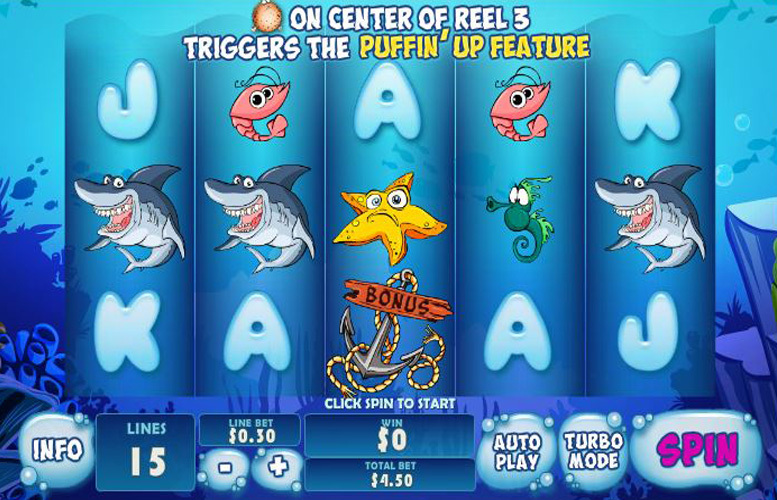 Players should note, however, that the Puffin’ Up Feature cannot be re-triggered and it is available during the main game and wacky waters free games. Landing three or more hermit crab “scatter” symbols anywhere on the reels will trigger the Cash Crab Feature. Here, players must pick one of the cute crustaceans to reveal cash prizes. The more “scatter” symbols landed, the more picks players receive. Three, four, and five hermit crabs will award one, two and three picks respectively. If players are especially lucky, a special crab might be hiding in one of the shells. Finding that will award a prize of 100x the initial bet. Players should note that the Cash Crab feature cannot be re-triggered and it is available during the main game and wacky waters free games. Landing the “bonus” anchor symbols on reels one, three, and five simultaneously will trigger Albert’s Underwater Bonus. In this side game, Albert has gotten himself caught on an anchor. Players must use the arrows to choose a path for Albert to swim in. Once chosen, they click on Albert to start swimming. He passes different objects along the way and picks them up until his air runs out. +5 free games = free games. Air bubbles = air for Albert. 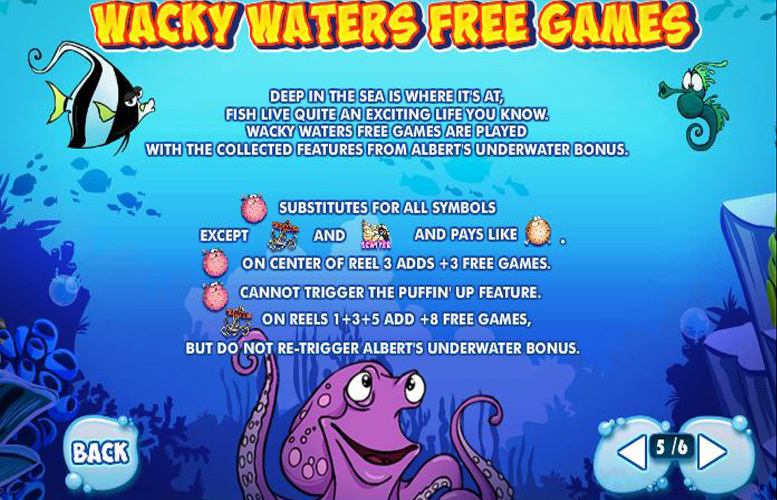 All the objects that a player collects during the bonus will be used during the Wacky Waters Free Games and Albert’s Underwater Bonus cannot be re-triggered. 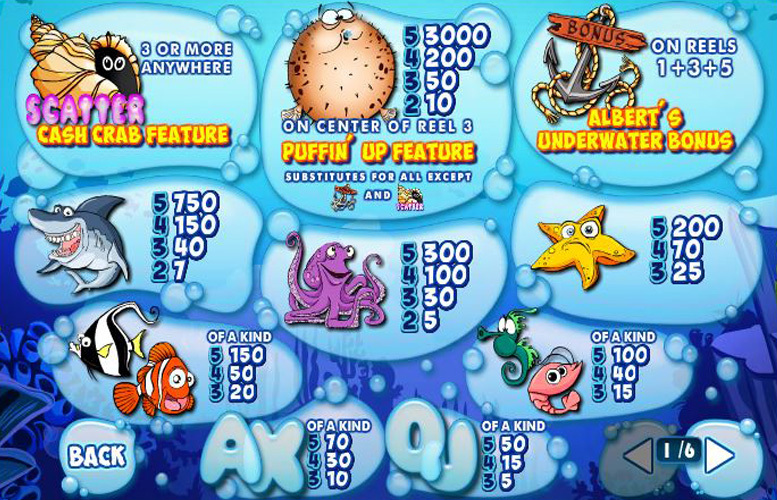 Following the Albert’s Underwater Bonus, players are immediately able to play eight free games. Here, Albert is wild and substitutes for all symbols except the anchor and scatter. Landing his symbol on the centre of reel three adds three additional free games. 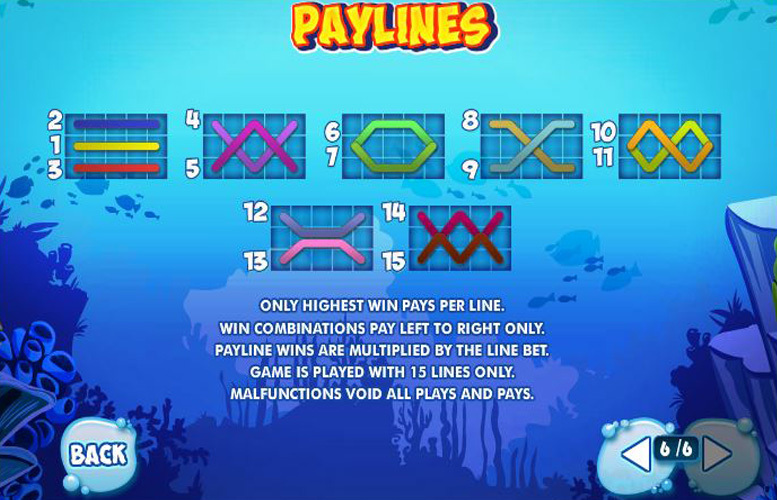 Players should note that landing an additional three anchor symbols on reels one, three and five will add another eight free games, they do not, however, re-trigger Albert’s Underwater Bonus. Ace, or King = 70x the line bet. Queen, or Jack = 50x the line bet. Players are only able to vary the amount bet per line on Wacky Waters. The number of win lines played per spin is fixed at 15. The lowest possible bet per line is just 1p and the highest is £75. This makes the minimum cost of a spin just 1p, and the maximum a sizeable £1,250. This means that Wacky Waters is ideal for players with just about any sized bankroll. Overall, Wacky Waters is a great slot machine. It’s got some fantastic bonuses that are exciting, and potentially lucrative, and it’s a nicely designed game to boot. The cartoon-like illustrations of the underwater creatures fit the light-hearted tone and feel of the game well, and all told, the package is a very strong one. There’s not a great deal to dislike about Wacky Waters. However, the reason for it’s not-quite-perfect score is due to it lacking that extra something to make it an amazing slot. This game has a rating of 7 / 5 with 471 total reviews by the users.